I was glad that Lewis Hamilton won at Silverstone and in such dominant fashion; the chorus of Lewis-bashing had reached so ridiculous a crescendo that it became as irritating as the Hamilton worship of the tabloids that preceded it. Perhaps this win will even things out a bit and we can discuss the guy in more realistic terms in future. Contrary to some commentators, I do not feel that the margin of Hamilton's win was an unfair reflection of his superiority on the day. Ferrari maintain that they could have won, had they not made the wrong tire choice at Kimi's first stop, and it is true that Raikkonen would have been closer without that blunder. But that ignores the fact that Kimi was on the right tires after his second stop and still managed a couple of spins whilst nowhere near the consistent pace of Hamilton. Both Ferrari and McLaren have made strategic errors this season and their drivers have paid for them. Of the two, it does seem that the Italian team go in for more inexplicable decisions and not changing Kimi's tires at the first stop seems to me one of these. If you're battling for the lead, you don't take chances on the weather, you go for the best compromise. That is what McLaren did and it paid off - but even if the rain had eased off as Ferrari expected, I doubt that Raikkonen's old tires would have been any better than Hamilton's new ones. That is why I consider the decision to have been a blunder. And Raikkonen is driving for a team that makes a lot of these, perhaps trying to be as cunning as they were in Ross Brawn's day. If Ferrari ever decide to forget winning through tactics and just concentrate on giving their drivers the best car, the other teams will need to start worrying. It does look as though Hamilton is the rainmeister of the current crop of drivers; as one of the commentators on American television said, he makes it look easy while everyone else (bar Mr Consistency, Nick Heidfeld) is spinning off. Before the race, everyone was talking about the wet weather skills of Button, Kubica and Raikkonen, but now Hamilton has proved himself in a class of his own. We can talk of how much easier it was for him when the heavy rain came and he had a huge lead, so being able to take things carefully. But that argument proves empty when we compare Hamilton's times with Barrichello's on extreme wets and Heidfeld's on inters. Rubens was four or five seconds quicker than Heidfeld at the time, Hamilton was very close to Rubens' times on most laps. If Hamilton was relaxing (and Whitmarsh says he was), just how fast could he have gone? What it amounts to is that Hamilton will be the one to watch whenever we have a wet race. The car is certainly good enough to challenge Ferrari, even in the dry, but put Hamilton in it when it's raining and I think he will win nine times out of ten. Martin Whitmarsh did say something else that caught my eye in the interview just mentioned. He spoke about new oil technology being employed to improve engine performance, thus reminding us of similar work being done by Renault and Elf earlier this year. It sounds like scraping the barrel but even the slightest improvement helps in F1 - and it is yet another demonstration that cost-cutting measures of the type that the FIA introduce do not work. I am quite sure that just as much money is being spent on lubricant research as would have been on engine development without the freeze. It also shows that engineers will find ways to make the cars faster, whatever restrictions are placed upon them. If the FIA are seriously bent on making all the cars equal, they will have to take things to the logical extreme of a spec series. And none of us want that, surely. I have to agree with you 100%. His drive can go down as one of the best wet weather drives ever and there wasn't a driver on the track who could even come close. Ross brawn proved his savvy when he stuck Rubens on extreme wets. It was great to see Rubens on the podium. Lewis deserved that win, but the British press like to build their heroes up just so they can tear them down again. It's a shame. I think that you choose the right words to define the Hamilton´s bashers and haters attitude. Ridiculous! In this two weeks the McLaren fans has read all sort of comments about Lewis and his team, his family, his friends, his free time, his sponsors, his driving skills, his girlfriends, his talk with Jenson about triathlon, his underpants and so on... That nonsense became annoying! The win was so massive that let them with an egg on face. About Rubens and Ferrari I agreed with Stew. The LACK or HAVE of Braw´s inputs was easiest demonstrated in the Ruben’s podium and in Kimi´s fail after his first stop. Talking about Rubens, the podium tomorrow was a supreme joy for me: all my favorites drivers were there, Nick, Lewis and Rubens. Rubens, at the end of the race, dedicated his podium to his son, Eduardo whom call him on Saturday after the qualifying to say that was desiring a rain to Sunday… What a confidence on his father! Why are Honda better at picking tires than the entire rest of the field, and when are they going to get better with the rest of the car? It was a masterclass of Senna proportions. He really is by a mile the best driver in F1. I have to admit I actually compared him to Gilles at Watkins Glen in the early laps. He was utterly dominant. When was the last time someone lapped every one of his championship rivals including his team mate? I don't think that Hamilton's winning margin was a fair reflection of his superiority. Had McLaren changed his tyres to wets at or near the beginning of the window for that tyre change, I think he'd have lapped the field - whether he was relaxing or not. it is truly better to talk quietly and carry a big stick. For heavens sake understate it, say you were lucky not to spin, etc... Sandbag your competitors - they will truly want to believe luck, tyres whatever were involved and will not attempt to close the ability gap with training. He would be well served to more and more emphasize luck or the team the more he wins. What he says in public at this stage of career should be a whole lot more humble than what he, probably rightly, is thinking. say wait until I have three championships boyo. having any core of honesty or strength of personality. First laps of Fred at Silverstone were SO INCREDIBLE that whole TV commentators said that he was on monsoon tyres..... It's enought to qualify a driver, men. Wow, Architrion - it seems Alonso's fans are as mentally fragile as the man himself when it comes to Hamilton! Hungaroring? that'll be 2006 - what place did he come? 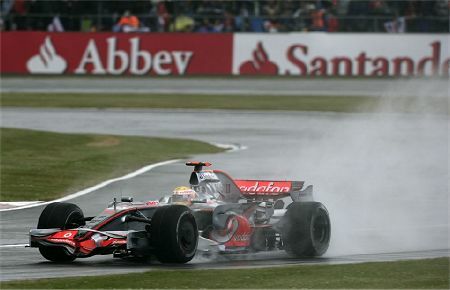 Silverstone 2008? - what place did he come? A few crash and burn laps does not a maestro make...! having looked good for a while. Hamilton's race was impressive and a joy to watch, but certainly he wasn't flawless. He almost had an incident with Kovalainen which could have damaged his car, and went off once. In Monaco, he also crashed, and only a SC gave him the chance of winning the race(again, his pace was incredible). I'm not saying his performance wasn't incredible. It was. But it's a bit soon to proclaim him the new God of Formula 1. Until Friday, Hamilton was crap and Massa the true next champion. Today, Hamilton is the new rainmaster and Massa the spinmaster. Ahhh, dear Peter. Reading your post and under your ratings procedures, I would say that Ayrton Senna's second at Monaco behind Prost is nothing to be remembered because he was second at the end..... In my memory that was a glorious to see, as it was Fred at Nurburgring and Hungaroring, as it was Hamilton at Fuji. To say that Fred's fans are a little too anxious (assuming that I am, which is not the case; maybe you overbraked, my friend) is half a sin of hyped Hamilton's fans. I must not have been watching a different Lewis Hamilton in Canada, because that was far from one of the best F1 drivers of all time, or any time. When Lewis can go an entire season with 2 or fewer mistakes, I will consider him for an honer like that. So far, very inconsistent throughout his career. I do remember Lewis BLOWING a 17 point lead last year with 2 races to go in the WDC. He is not 'out of the woods' yet, it's just one race. Stew: If Hamilton's drive Was amazing, even more so was Ross Brawn's tactical decisions for Honda. Time and time again, the old maestro outwits the other teams and his drivers suddenly appear near the front as if by magic. Barrichello's race was a classic of Brawn strategy - if you look at the fastest race laps, Rubens just shouldn't have been anywhere near a podium. As long as strategy and tactics remain as important in F1 as they have become, Ross is worth his weight in gold to any team. Chunter: You ask why Honda seem better at choosing tires than any other team and I think the answer has to be Ross Brawn. It is not that he can tell what the weather is going to do or anything like that - it's much more that he is running a team at the back of the grid and can afford to take chances. Any difference in Honda's strategy from the other teams' will either give them an advantage if it pays off, or disadvantage them when it doesn't. When you are running at the back, how much further back can you fall if a gamble doesn't work? Add to that Brawn's immense experience of setting and adjusting tactics throughout the race and the Honda team will gamble successfully more often than not. Barrichello's podium place was the result of all the strategy and gambles paying off at once. Steven: Still too early for me to echo your ranking of Hamilton as the out-and-out best - but he has the title of rainmeister as far as I'm concerned. I still think Alonso is one of the best in the dry and I strongly suspect that there is much improvement left in Kubica. These three are my bets for a great triumvirate of drivers that will battle constantly for the next decade - and Hamilton needs to keep a close eye on that Polish guy! Alianora: What can I say? I agree. Peter: Whilst I agree with most of what you're saying, I do think that Hamilton is interpreted in whatever way suits the commentator. He may sound arrogant when he says his pace was ridiculous but that is not necessarily a claim to superiority - he could just as easily mean (and I think he does) that everything was right on the day: he was in the groove, so was the car, the tactics and the strategy. His use of the word "ridiculous" indicates that he is a bit at a loss to understand why he was so much quicker than anyone else (yes, I know Kimi grabbed fastest lap but Hamilton didn't need to). If we listen to the rest of the interview, he expands on his comment and makes it clear that it was the whole package that won, not just his talent. As for the comparisons with Senna and Stewart, the truth is that he was fending off suggestions from others that he is their equal. But you're right that he should reign in his enthusiasm. It is natural that immediately after winning a race he should be pleased and allowing it to bubble over a bit but, considering all the criticism he has received for previous statements, he should be much more careful what he says. Walk softly and carry a big stick is always the best policy. Architrion: Hey, give me a break! I didn't say that Hamilton is the greatest driver in the universe - I merely awarded him the title of rainmeister. And I have written many times this season about how Alonso is showing incredible skills in an uncompetitive car. As far as I'm concerned and on the evidence to date, there is little to choose between Fernando and Lewis in the dry. But let it rain and Hamilton will win more often than Alonso. Samuel: I didn't say Hamilton is God - in fact he isn't, he's just very, very good in the wet. And yes, he made an error, but one so small that he was able to control it. Aracer: Quite right, the jury is still out. Hamilton seems to have saved up all his mistakes until the end of last season and the beginning of this one - it remains to be seen just how much he has learned from them and whether he will build on that. But the race he drove at Silverstone was pretty special, not on a par with Senna's at Donington in 1993, but very good even so. I give him his due - he knows how to drive a car in the wet. I've read your post and it was a fair and balanced opinion, which I can agree or not (mostly I do indeed). But you haven't gone so far to rate Hamilton as the neverseen monsoon driver.... that is so far beyond the limits of my understanding!!!!!! I was extremely bored of all that Hamilton bashing before the race. In fact I only found the Canada incident as a true an incredible error (maybe a pure consequence of inexperience and stress). But now I find even worse all this hype about a race where he drove fantastic, but against a whole camp of spinchampions. Let's keep a balanced mind and try to find the best point of view to see the whole picture. Agreed, Architrion, if we can stay balanced while others waver from one extreme to the other, we have a much better chance of being right in the end. Hamilton is good but he is human and makes mistakes too!